Westbrook is a suburb of Portland and a city within the Cumberland County. It's population is 17,494 residents within a total area of 17.33 square miles. The city is unique because it has rivers running through it as well as parts of Highland Lake. There are two prominent falls (the Saccarappa Falls and the Congin Falls) which are fed by the Presumpscot River which flows through the center of Westbrook. The Stroudwater River also flows through on the southwestern side of the city. Getting in and around Westbrook is fairly easy. Freeway access is served by Interstate 95, U.S. Route 302 and State Routes 22 and State Route 25 (as well as state Route 25 business). The city is bordered by the town of Falmouth to the north. It is bordered by Portland and Scarborough to the South as well as Portland to the East. Gorham and Windham borders the city to the West. 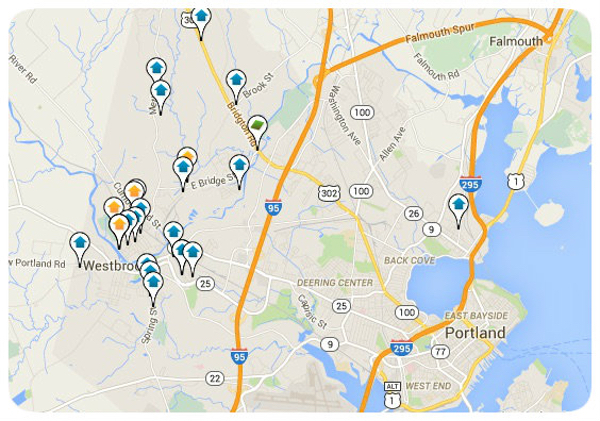 Westbrook has a similar process of naming their neighborhoods as Portland and South Portland. There are several distinct neighborhoods that the residents have organized, although there is no legal concurrence or signage to make these official names. Although there is no legal significance to these designations these names have been firmly entrenched in the various cultures of the neighborhoods. Homes in Westbrook have a median listing price of $184,900. However the median price for homes that are sold in the area is $203,200. Although the average sale price may be higher the actual square footage is less than the Portland Metro area. Westbrook is currently listed at $144 per square foot while the Portland Metro area is $165 per square foot. Anyone looking to purchase a home in Westbrook should take notice that these properties are moving fast.